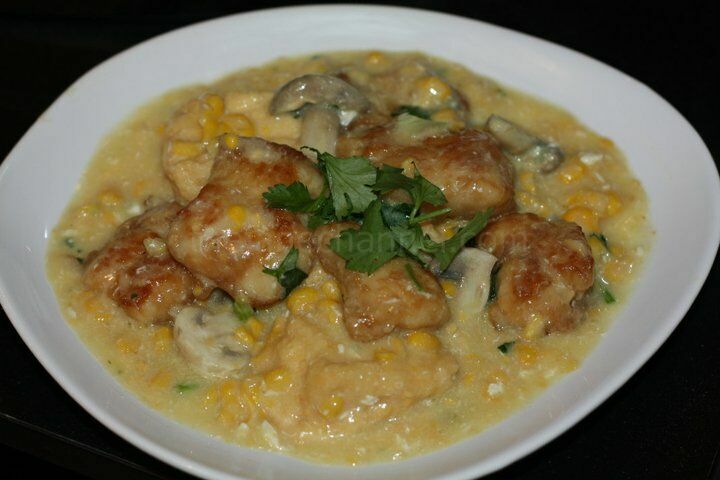 Fish Fillets with Creamy Corn Sauce is the dish I make when I want something good and easy for dinner. The two major components for this dish is one can of creamy style corn and one fish fillet. All the other ingredients can be any vegetables you have at home. In a medium skillet, pan fry fish pieces for 3 minutes on each side until golden and cook through. Remove from pan and set aside. Heat oil in a skillet over high heat. Stir in garlic for 1 minute. Stir in mushrooms and cook for few minutes. Add cream-style corn, water and fried tofu. Lower the heat and simmer for 4 minutes or until the sauce thickens. Stir in fish pieces and mix well. Turn off the heat and quickly stir in the egg with a spoon or chopsticks to form feather-like patterns. Top with cilantro and sesame oil! hello there and thank you in your info ? I’ve definitely picked up anything new from right here. I did then again expertise a few technical issues the usage of this site, since I skilled to reload the site a lot of occasions prior to I may get it to load properly. I were puzzling over in case your hosting is OK? Not that I am complaining, but sluggish loading instances times will often impact your placement in google and can damage your high-quality ranking if advertising and marketing with Adwords. Well I am adding this RSS to my email and can look out for much more of your respective exciting content. Ensure that you update this again soon..